Kayaks offer a fairly simple way to burn some calories while exploring a variety of waterways. They travel through shallow areas that many vessels cannot safely enter. These boats also weigh considerably less than most watercraft, so they're easier to lift and carry. If you want to buy a kayak, the first step is to choose a suitable type. Touring kayaks maneuver well in rough water, and they're popular among boaters who embark on lengthy voyages. These vessels often feature comfortable seats and polyethylene construction. Long-distance travelers benefit from spacious storage compartments. However, touring kayaks weigh and cost more than some of the alternatives. Inflatables prove desirable for people who live in apartments or drive compact vehicles. They fit in duffel bags when deflated. These lightweight boats usually consist of polyester with a PVC coating. The downside is that it takes extra time and effort to travel the same distance. Inflatables also puncture more easily than other vessels. Beginners frequently choose recreational kayaks. These affordable polyethylene boats offer greater stability, and many models feature handy storage compartments. On the other hand, they don't perform especially well under windy conditions. Another noteworthy disadvantage is that they're somewhat heavy. A modular or folding kayak delivers some of the same benefits as an inflatable, but it performs markedly better. These rugged boats disassemble to fit inside vehicles, closets and small storage lockers. You can reconfigure a modular kayak to hold a different number of passengers. Some models feature tough metal frames. The size and shape of a kayak have a major impact on its performance and portability. Long vessels normally allow boaters to travel more quickly, while short models boost maneuverability and fit in smaller spaces. A narrow boat moves significantly faster, especially if it has a rounded hull. On the other hand, wide units provide the most stability. Tandem kayaks hold two people, but don't forget to check the weight limit. Sit-on-top kayaks have molded plastic seats and no cockpits. This design exposes a person's entire body to the weather. These boats are stable and easy to clean, but they don't perform as well as most other types. Beginners, anglers, tall people and swimmers may prefer sit-on-top models. Pricing, durability and weight vary depending on a boat's primary material. Fiberglass and other composites weigh relatively little, and it's comparatively easy to fix them. Polyethylene costs substantially less; this rugged plastic remains hard to repair and vulnerable to sun damage. 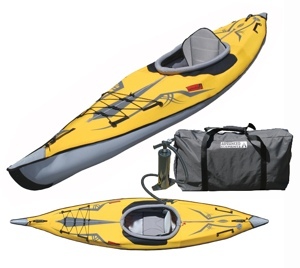 An ABS kayak is light, long-lasting and somewhat costly. If you select a touring kayak, it may feature a rudder. This equipment improves steering but adds a little weight. Another way to enhance performance is to choose a boat with comfortable foot pegs. They help maximize the power of each paddle stroke. Many models have pegs that adjust to accommodate different kayakers' heights. Extra features play a key role in many kayak-buying decisions. Things like integrated tackle boxes and rod holders make life easier for fishing enthusiasts. A watertight storage compartment offers a safe place to keep snacks, a camera or your wallet. It also increases the boat's buoyancy. When you compare various boat types and features, be sure to think about a wide range of factors. Important considerations include your expertise level, budget, local climate, body type and desired travel destinations. You'll use a kayak more often if you can easily transport the boat and store it in your home. If you decide to buy a new kayak, consider browsing boat dealerships, sporting good retailers or department stores. You can pay somewhat less by finding a used kayak in the classified ads. Remember to check for leaky paddles, inoperable rudders and indications of prior damage. Even after a kayak has been fixed, an accident can make it harder to control or increase the likelihood of future problems. A repaired component seldom remains as sturdy as a part that was never damaged. If someone has repainted a boat, the paint may hide signs of previous repairs. While characteristics like speed, maneuverability and styling certainly matter, it's vital to keep the most important goals in mind. Your top priority should be to find a safe, comfortable boat that easily transitions from storage to use.